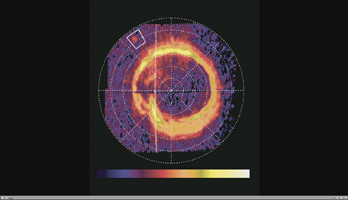 The three spot detections in the movie were obtained by Cassini's ultraviolet imaging spectrograph on at 8:00 p.m. and 9:20 p.m. PST on Aug. 25, 2008, and 1:02 a.m. PST on Aug. 26 (3:00 a.m., 4:20 a.m. and 8:02 a.m. UTC on Aug. 26), a period of time spanning five hours and two minutes. The footprint moved according to changes in the position of Enceladus. In the image, the colors represent how bright the extreme ultraviolet emissions are. The lowest emission areas (one to two extreme ultraviolet counts per pixel) are in black/blue. The brightest emission areas (500 to 1,000 extreme ultraviolet counts per pixel) are in yellow/white. The footprint was located about 65 degrees north latitude. It measured about 1,200 kilometers (750 miles) in the longitude direction and less than 400 kilometers (250 miles) in latitude, covering an area comparable to that of California or Sweden. In the brightest image the footprint shone with an ultraviolet light intensity of about 1.6 kilorayleighs, far less than the Saturnian polar auroral rings. This is comparable to the faintest aurora visible at Earth without a telescope in the visible light spectrum. The sun was illuminating Saturn's north pole from the left and the footprint was on the day side of the planet. The night side of the planet was to the right of the hashed line. For more information about the Cassini-Huygens mission visit http://www.nasa.gov/saturn and http://www.nasa.gov/cassini. The ultraviolet imaging spectrograph team home page is at http://lasp.colorado.edu/cassini.